Not long ago, I went to Litchfield County, Connecticut. I had two extremely different ice cream experiences there--let me tell you about them. First, I visited a place called Arethusa Dairy. It had been recommended by a dude who worked at a clothing store nearby. The clothing store was slightly uppity and lacked rainbow or sparkle clothing, so I did not buy anything. But I was thankful for the ice cream tip. So, a spy venture to the nearby dairy, where they make the ice cream using the cream from their own cows (which they may or may not sing to, depending on rumors I heard from people around town). The stark, well-designed interior worried me a little bit at first--I tend to trend toward more homespun type ice cream shoppes. If it's spelled "shoppe" that is a good thing to me. 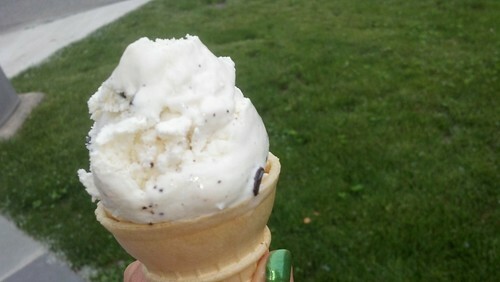 The menu is small, but well-chosen: Vanilla, chocolate, Butter Pecan, Maple Walnut, Rum Raisin, Coconut Chip & Mint Chip. I went for the coconut chip. 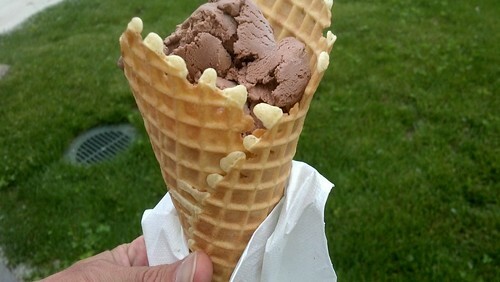 The ice cream was of high quality, but I'd like to warn you to go for a double scoop or a waffle cone, because my single scoop was just that: a single scoop, not packed in, atop a wafer cone. The creamy coconut chip ice cream pleased me greatly: I just wanted more of it. After my experience at Arethusa, I learned that the dairy is the hobby-lovechild of two Manolo Blahnik (yes, the shoe designer) executives. I don't know if this made the experience more or less interesting. As my friend Phil says, "Dairy is so hot right now". Maybe because it's gluten-free? Not far away, at Peaches n Cream ice creamery, I got fed. From the moment you enter this charming ice cream shop, you get the feeling that it's been there forever. They have a ton of flavors; after about 15 minutes of analyzing all of them, I decided on the cashew cream. But wait, there's more: I topped it with caramel sauce. Wow, what a good decision my flavor combo was. The rich, nutty ice cream "scoop" was quite generous, and it was full of cashews, lightly salty against the sweet cream. The caramel sauce was somewhat crack-like, making me wonder if I could buy a cup of it just to drink by itself. Peaches N Cream also makes ice cream sandwiches to order, so you could, for instance, say "give me an ice cream sandwich filled with maple walnut ice cream"...and they will do it right before your eyes. It's probably pretty obvious that out of the two spots, I personally found Peaches n Cream to have a little more personality and soul. That having been said, both spots made a mean scoop of ice cream--if you're trying to decide between visiting one or the other, you've got to carefully consider what you're looking for in your ice cream experience. If you're looking for a farm-to-table experience complete with deliciously fresh ice cream, with sleek, well-designed surroundings, and are not afraid of a line, hit up hot-spot Arethusa. 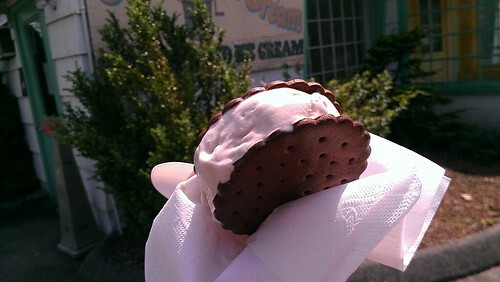 If you are more into kitsch and quantity and not-fancy but still very good ice cream, hit up Peaches n Cream. Or, better yet, hit 'em both up and let me know what you think. Delicious research! 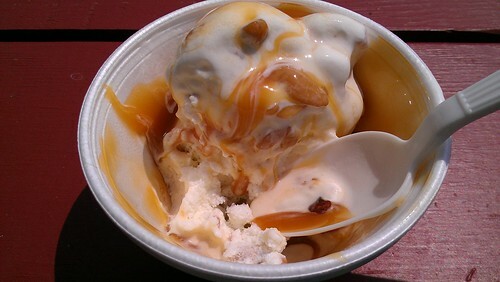 Arethusa Dairy, 822 Bantam Road, Bantam CT; online here.